EUX1437 | December 6-20, 2014 | 14 days, from £5,600 in a Veranda/Ocean Suite, category 1, cruise only. On board credit for beverages of €200 per person. EUX1501 | January 3-17, 2015 | 14 days, from £5,320 in a Veranda/Ocean Suite, category 1, cruise only. On board credit for beverages of €200 pp. EUX1507 | April 1-11, 2015 | 10 days, from £4,150 in a Veranda/Ocean Suite, category 1, cruise only. On board credit for beverages of €200 pp. EUX1509 | April 24 – May 2, 2015 | 8 days, from £3,570 in a Veranda/Ocean Suite, category 1, cruise only. On board credit for beverages of €150 pp. EUX1513 | May 21-29, 2015 | 8 days, from £3,650 in a Veranda/Ocean Suite, category 1, cruise only. On board credit for beverages of €150 pp. The offer is limited and subject to availability. For more information on Hapag-Lloyd Cruises’ please call Gay Scruton at The Cruise People Ltd in London or e-mail cruise@cruisepeople.co.uk. The Europa 2, Hapag-Lloyd Cruises’ latest addition to its fleet of luxury and expedition ships, was launched in May of 2013 and has just celebrated her first year in operation. In recognition of this, Hapag-Lloyd Cruises CEO Karl J Pojer and Europa 2‘s Director of Product Management, Julian Pfitzner, took the opportunity to host a press event in London. With its two ultra-luxury cruise ships and two expedition ships, Hapag-Lloyd Cruises is regarded as one of the leading operators in the luxury and expedition segment in the German-speaking countries. All cruises on board the Europa 2 are international, operated in both English and German. In its expedition segment, Hapag-Lloyd Cruises will offer a selection of international cruises on board its 5-star-rated expedition ship Hanseatic. The expansion of marketing in international markets goes hand-in-hand with the focus on the areas of luxury and expedition. “By consistently focusing on these two pillars, we strive to enhance further our strength and our leading position as regards quality in these segments and at the same time we will address new markets“, explained Pojer. Hapag-Lloyd Cruises has been able to increase its international guest base by 42 % between 2013 and June 2014. For its latest marketing activities, Hapag-Lloyd Cruises has selected the United Kingdom, United States, the Netherlands, Belgium, Australia and Scandinavia as priority target markets. “With Europa 2, we believe we have a perfect ship to offer an international flair and to address a sophisticated, cosmopolitan target group, planning in future to increase market share in our defined international markets”, says Julian Pfitzner, Director Product Management Europa 2. “It has been a good year for Europa 2 since her launch. In September she received the highest distinction of a 5-star-plus ranking from the Berlitz Cruise Guide 2014. This high rating reflects an overall 97% guest’s recommendation rate. Both are very positive distinctions for us,” explains Pfitzner. 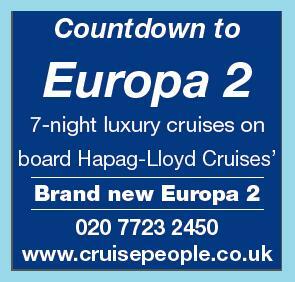 “Europa 2 is a modern and casual luxury ship, which does away with cruise traditions such as the captain’s dinner. With this new concept, Hapag-Lloyd Cruises has attracted 50% new guests – of which many have never cruised before.” With up to 500 guests, Europa 2 provides the greatest space per passenger of any cruise ship in the world. The ship features exclusively suites with verandas and a minimum area of 375 sq ft. Seven restaurants and six bars are dedicated to serving culinary diversity and a large spa and fitness area accommodates the well-being trend on cruises. Hapag-Lloyd revealed that its strategy to attract more international passengers was squarely focused on Britons, saying expectations were for the UK to make up 7½% of the line’s total bookings. In order to attract passengers, Hapag-Lloyd will be offering cruises that call in the UK and cruises that depart from the UK in addition to a complimentary €200 beverage package for all international passengers booking their first cruise on two of the line’s ships – Europa 2 and Hanseatic. The €200 onboard credit offer will come into effect on bookings beginning Autumn 2014. A specific date has yet to be set. CEO Pojer said the move had been decided based on feedback from UK passengers, who had repeatedly raised the subject of Hapag-Lloyd’s luxury vessels charging extra for drinks onboard, while gratuities and meals at all seven onboard eateries are included in the cruise fare. Pojer said: “We listen to our international customers, and we know there are needs that are different from the German market … From the feedback we have heard that the subject of all-inclusive is always coming up.” Pojer said Hapag-Lloyd was hoping to source 15% of its passengers from outside Germany. For more information on Hapag-Lloyd Cruises’ please call Gay Scruton at The Cruise People Ltd in London on 020 7723 2450 or e-mail cruise@cruisepeople.co.uk. In recognition of ms Europa 2 ‘s first full year at sea, Hapag-Loyd Cruises has a birthday gift for Cruise People clients. On seven cruises this summer you can enjoy cruising the Mediterranean at fantastic fares. You can enjoy even more space (560 sq ft) and cruise at a cost of just £5,460 per person in a guaranteed Spa/Grand Suite category 6, 7 or 8. In addition, Hapag-Lloyd Cruises has a special introductory offer to the UK market, with a 10-night cruise leaving Southampton on June 25 for Barcelona, with fares starting at £3,990 per person in double occupancy. A 2-night sampler cruise also leaves Hamburg for Southampton on June 23, with fares fropm £840. Free business class flights are included either to Hamburg or home from Barcelona. Unlike her fleetmate Europa, which concentrates on the German market, Europa 2 operates in the international market and full English-language services are offered on every departure year-round. For further details please call Gay Scruton at The Cruise Poeple Ltd in London or e-mail cruise@cruisepeople.co.uk. 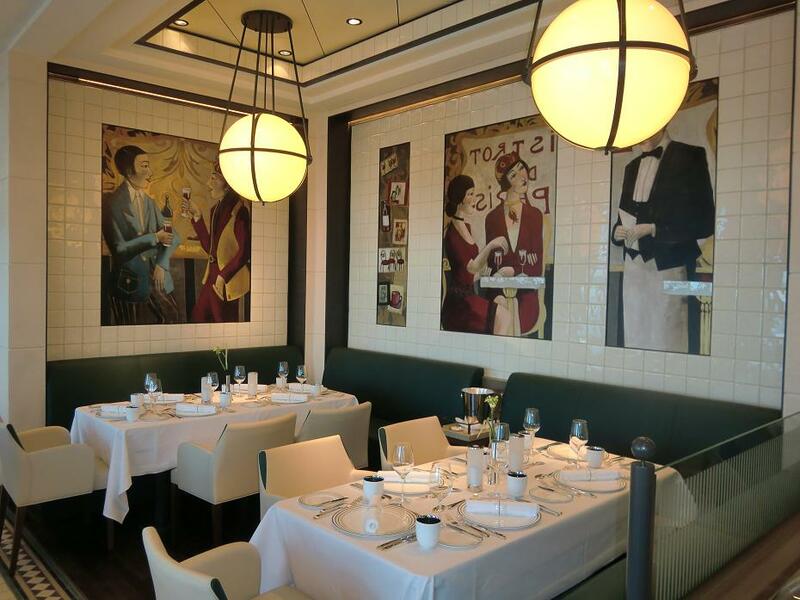 As we predicted in April 2012 after seeing the artist’s depictions of the public rooms and restaurants, Hapag-Lloyd Cruises’ Europa 2 has indeed turned out to be a real stunner. Compared to her fleetmate Europa, now fourteen years in service, it is difficult to see how cruise rating aficionados will not be able to give her an even higher rating, which would make her the top-rated ship in the world. With a passenger space ratio in the vicinity of 80 tons per passenger (a world record), this is a ship where everywhere you go the sea is with you. Along with the great and the good of the cruise and travel press, about sixty top UK cruise agents were invited on a one-night cruise from Southampton along the English Channel towards Cornwall last week. Also on board was Douglas Ward, editor of the Berlitz Complete Guide to Cruising & Cruise Ships. Two of the themes on the new ship are “Relaxed Luxury” and a “Hideaway at Sea.” This is quite different from what is on offer in the rest of today’s cruise market, even from ultra-luxury operators. Europa 2 is aimed squarely at a different audience – the affluent executive and professional classes still in work, younger in age and with growing children. The new ship’s dress code is therefore smart casual, not formal. To reach this audience, the new ship’s operation is quite different from others. Her summer cruises in the Mediterranean are based on 7-day itineraries that can be extended to 14 or 21 days, with no itinerary repeated before three cruises have elapsed. In addition, nannies will be engaged on a ratio of one for every four children. Because of this and the need to house entertainers, although the ship has been designed to accommodate 516 guests, it is unlikely that her passenger loads will ever exceed 480. Her shorter routes are ideal for a new audience. With 7-day combinable Mediterranean cruises and 13-to-20 day combination cruises to far-away destinations by winter, Europa 2 meets the requirements of young high-earning professionals and families with limited holiday time. Calling at 123 ports on twenty-six different itineraries this year, her cruises will take guests to the Mediterranean, the Arabian Peninsula, Southeast Asia and China, and then in 2014/15 to the Americas. All itineraries are based on ports that have plenty of air service and are easy to get in and out of – for example, Barcelona, Monte Carlo (Nice) and Venice, Dubai in the Middle East, and in the Far East, Singapore and Hong Kong. The ship’s size is a major advantage – with a length of 739 feet and a draught of 20.7 feet, Europa 2 is capable of calling at small, rarely-visited ports such as Bonifacio and Portofino, where larger ships cannot go. Twelve Zodiacs are also carried to take passengers ashore to lagoons and beaches that other ships cannot reach. 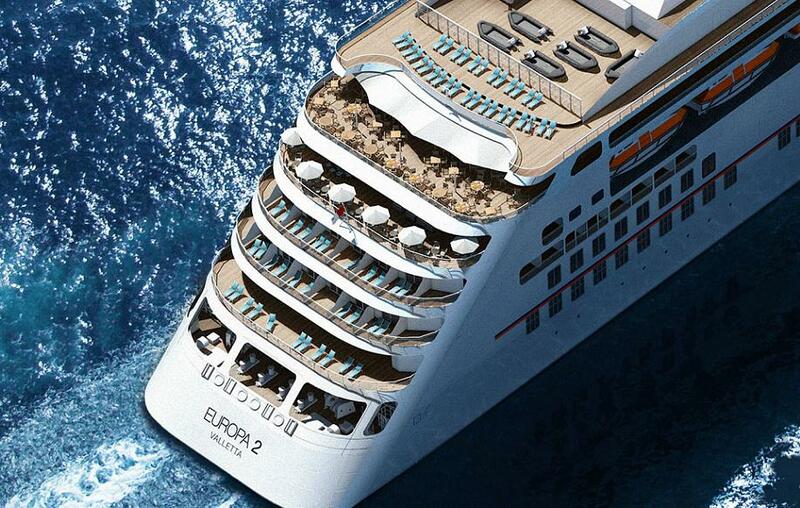 The Europa 2 also introduces some new concepts. She has a magrodome, but it is not the usual cover over a pool deck but is two decks high. The new ship’s accommodations are all Veranda Suites, with balconies each measuring at least 75 square feet. All suites come equipped with a free mini bar, Wi-Fi Internet access (at a charge) and a tablet computer. 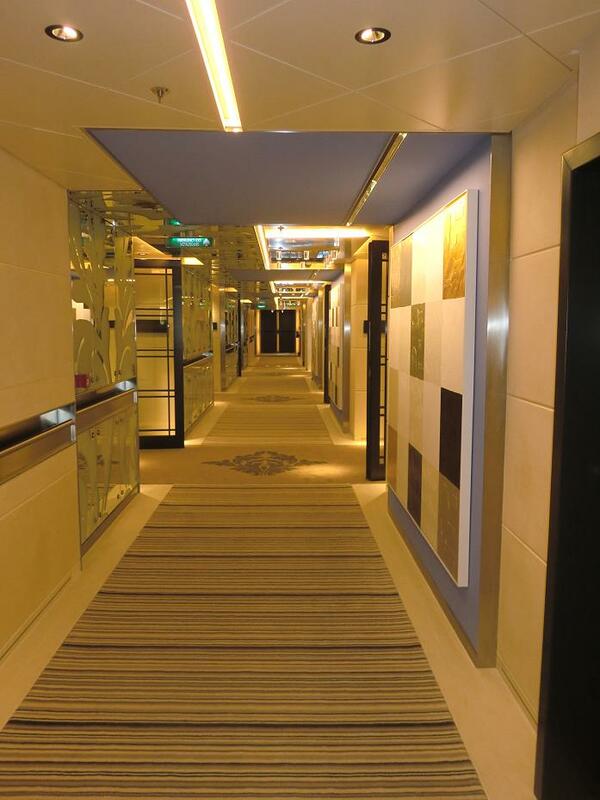 The ship‘s 251 suites come in seven categories measuring from 301 to 1,066 square feet. 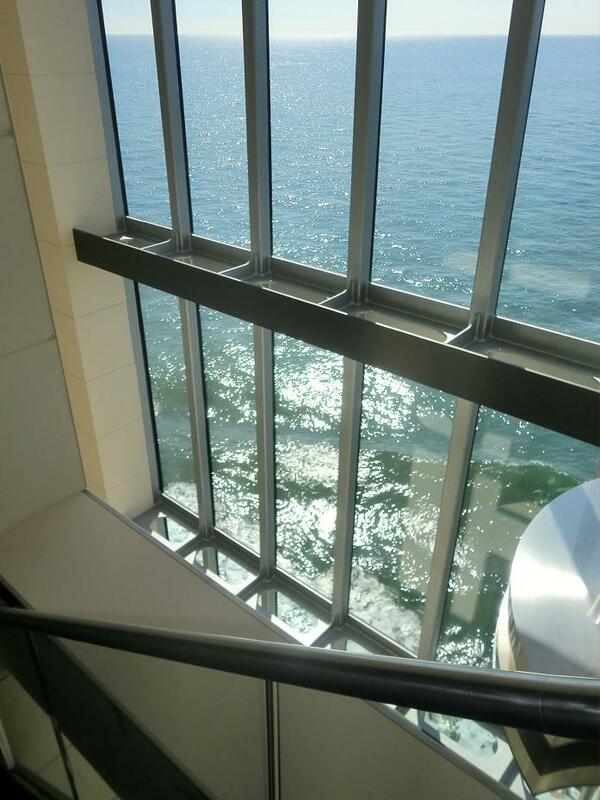 The highest categories have whirlpools with ocean view. Sixteen Spa Suites have whirlpool tubs and rain showers with steam saunas, providing guests with a private oasis of well-being. For families traveling together, there are seven family suites, where parents and children live in two separate areas, connected by a door and a shared balcony. What’s more, children up to the age of eleven are carried free of charge as long as they occupy a suite with their parents. Important to Europa 2 is that every cruise caters to international passengers who speak English. This is unlike the present practice, which is to nominate international cruises for each ship in the fleet. By this means, it is aimed to increase the number of English-speaking passengers by four- or five-fold, from ten to twenty per internatuonal sailing now to fifty to eighty in three to five years’ time. There are eight different restaurants to choose from and wines and spirits are sold at prices that are cheaper than onshore, unlike virtually every other cruise line other than the all-inclusive ones. Beer is about €1.40, a cocktail around €4.20 and bottles of wine run from about €14. The usual practice on cruise ships has moved away from such duty free prices to charging full shoreside hotel prices. Hapag-Lloyd’s goal is not to maximise on board revenue but to offer value and a good experience. Also, in the alternative restaurants, it will not be possible to book more than forty-eight hours in advance, giving an opportunity for all to experience them where on some lines old hands have been able to monopolise these spaces. All in all, some interesting ideas are coming out of Hapag-Lloyd Cruises and this ship is a real game changer. The most interesting thing about this ship was that at the end of the voyage many said they did not want to leave her. She was christened in Hamburg on Friday, May 10, 2013. 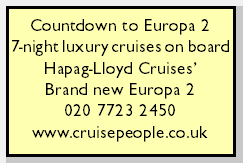 For further details on Hapag-Lloyd Cruises and how to book the Europa 2 please contact Gay Scruton at The Cruise People Ltd in London on 020 7723 2450 or Freephone 0800 526 313 or e-mail cruise@cruisepeople.co.uk. For details of Hapag-Lloyd Cruises’ Travel Concierge or any Europa or Europa 2 cruise please call Gay Scruton at The Cruise People Ltd in London on 020 7723 2450 or e-mail cruise@cruisepeople.co.uk. via Abu Dhabi, Doha, Mina Sulman, Bahrain; Khasab, Oman, and Muscat from £3,644 per person in a Category 1 suite, double occupancy, cruise-only. via Phuket, Port Kelang, Malaysia, Ko Samui, Kampong Saom, Cambodia and Koh Kood, Thailand from £6,752 per person in a Category 1 suite, double occupancy, cruise-only. via Bintulu, Malaysia, Kota Kinabalu, Malaysia, Sandakan, Malaysia, Boracay, Philippines and Hundred Islands, Malaysia from £5,496 per person in a Category 1 suite, double occupancy, cruise-only. For further details please call Gay Scruton at The Cruise People Ltd in London on 020 7723 2450 or e-mail cruise@cruisepeople.co.uk. The Next Best Ship: Europa is a rather special vessel. She’s been voted the best in the world by cruising’s most revered critic, Douglas Ward, for 13 years running. From this May, though, she’ll have a sister ship to vie for the title. 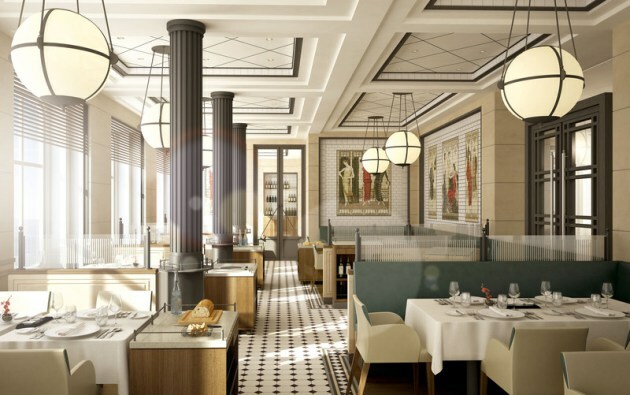 Europa 2 promises a “more casual and modern approach,” which translates as trendier interiors, glitzy entertainment, a cookery school and far fewer black-tie dinners. Will they maintain the same impeccable service and superb food? You be the judge on a seven-night voyage from Barcelona to Monte Carlo, casting off on June 22. The Cruise People (020 7273 2450) has the trip from £3,070, full-board. Flights are extra; easyJet (0843 104 5000, easyjet.com) and British Airways (0844 493 0787, ba.com) fly to both Barcelona and Nice. Call Gay Scruton at The Cruise People Ltd in London on 020 7723 2450 or e-mail cruise@cruisepeople.co.uk.